Ecuador has granted a request from Swedish prosecutors to question WikiLeaks’ founder Julian Assange at its embassy in London, where he has been holed up for over four years. Assange was granted asylum by Ecuador in 2012 after he slipped into the country’s embassy in the U.K. He is wanted by police in Sweden for questioning in connection with a sexual assault investigation. U.K. police have said that they would arrest Assange to meet an extradition request from Sweden if he steps out from the Ecuador embassy. But Assange and his supporters have expressed fear that from Sweden, he could be transferred to the U.S. to face charges under the country's Espionage Act. It is not clear whether the restraints on Assange proceeding to Ecuador or some other destination from the U.K. will be removed after the Swedish prosecutors' proceedings. The UN Working Group on Arbitrary Detention ruled in February that the time Assange has spent in the London embassy amounted to arbitrary detention by the U.K. and Sweden. The decision by the body is not binding on the two countries but would have put some pressure on them to resolve the outstanding issue of Assange’s prolonged stay in the embassy. Ecuador said Wednesday it stands by its offer of asylum to Assange as long as fears of political persecution still continue. It said a date for the questioning by the investigators from Sweden is expected to be finalized in the coming weeks. Ecuador said it had offered to facilitate Assange's questioning at the embassy for over four years. 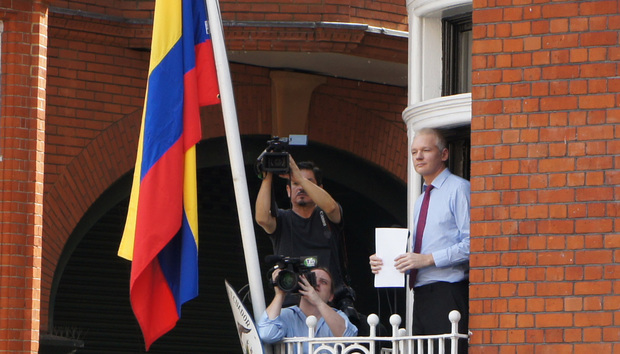 “Four years later Sweden accepts Ecuador's offer to take Assange's statement. Maybe,” WikiLeaks wrote in a tweet that referred to a news report by Latin American outlet teleSUR on Ecuador's announcement. WikiLeaks has published leaked diplomatic cables and other information that embarrassed several governments, including the U.S., and international businesses. Assange and WikiLeaks are once again in the eye of a a controversy after the whistleblowing site released ahead of the convention of the U.S. Democratic Party emails hacked from the Democratic National Committee, which showed that the committee had favored presidential nominee Hillary Clinton over her rival Senator Bernie Sanders. Security experts have said that the mails could have been stolen by Russian hackers, even speculating that Russia was trying to influence the U.S elections. WikiLeaks has refused to disclose its source.